To global search giant, Google, Africa is the next Internet hotspot. Globally, there are 94 domains registered per 10 000 users. However, in Africa, there is only one domain per 10 000 users. As such, there is tremendous potential for growth on the continent in the web space. Through its Africa programs focused on getting more Africans online, the company is betting that by developing an accessible, vibrant and self sufficient Internet ecosystem on the continent many more Africans would come online. Key among its strategies to develop the continent’s Internet ecosystem is to increase the amount of local African content online. “If you want to be successful you have to do a good job at localising content,” said Nelson Mattos, Google’s VP of Development for Europe, Middle East and Africa (EMEA) at a Google event in South Africa. To do this effectively, the company has launched initiatives such as the Get African Business Online (GABO) initiative last year as a pilot to a select number of businesses in Nigeria. The initiative targeted small and medium scale enterprises and empowered them to set up an online presence for themselves to promote their goods and services. In addition, the company is working with Universities across Sub-Saharan Africa to help expand their bandwidth capacity through its University Programs providing much needed Internet access to student populations across the continent. For instance, last year, the company launched its university access initiative at the University of Nigeria, Nsukka where Nigeria’s Vice President Namadi Sambo launched the campus’ new wireless network, intra-campus fibre and trans-national fibre connection to MainOne, an under sea cable system in West Africa. See this infographic on current submarine cable launches in sub-Saharan Africa. Similar access launches have since occurred at other universities in Ghana, Kenya, Uganda and Nigeria among others where in addition to bandwidth capacity, participating universities get free deployments of Google Apps for Education on campus. Other initiatives include Baraza, its free question and answer service for the continent, its search products in local African languages and its free SMS health and agricultural tips in places like Uganda among others. Interestingly, thinking local has started to pay off. According to Google’s Program Manager for African Languages, Denis Gikunda, Google Inc.’s search requests from sub-Saharan Africa are growing more quickly on African language pages than those in English, French, or Portuguese. “For so many people in Africa, with technology, there’s this idea that I have to master English first, and then I can be good at it,” he said. “But if you see a user interface in Swahili, you feel like you understand the product more, and understand what you can do with Google search,” Gikunda said. Thinking local has also involved thinking of creative ways to market Google products to an African audience. 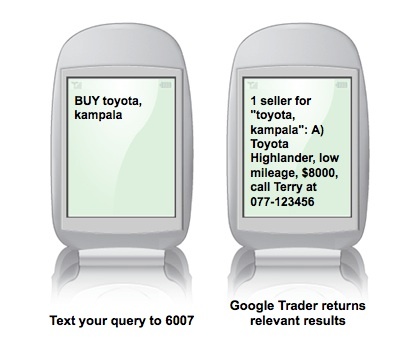 Last year, the company launched its sms and web based classified ads product, Trader in Ghana having launched it earlier in Uganda. To reach out to Africans, the product was launched using flash mobs and a musician singing a catchy jingle about Trader on the streets of Accra. Despite the prospects, the continent poses its unique challenges. Problems such as low literacy rates, high levels of poverty, low levels of power supply in some African countries and lack of awareness about the Internet by majority of Africans pose as impediments. However, the company has continued to launch its projects in Africa’s challenging terrain, launching tech events in various African countries aimed at strengthening the continent’s burgeoning tech ecosystem and building a passionate community of developers and tech enthusiasts. To read more about Google’s Africa initiatives, read this post on its recently launched tech incubator, Umbono.